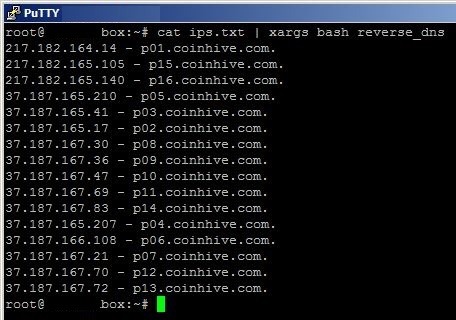 Recently I’ve encounter list of IPs that are related to CoinHive. So I want to check for these IPs DNS. We can do that by using dig command to perform reverse DNS (rDNS). Reverse DNS (rDNS) is a method of resolving an IP address into a domain name, just as the domain name system (DNS) resolves domain names into associated IP addresses. This entry was posted in technique and tagged bash, coding, linux on 10/06/2018 by zam.